U.S. Air War College students heard Webster faculty insights on several contemporary security topics affecting the Mediterranean region. 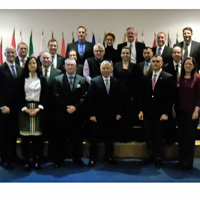 Webster University's Athens campus hosted a delegation of United States Air War College students on March 10 for an academic event organized by the Research Institute for European and American Studies (RIEAS) based in Athens. The students were in Athens are on a regional cultural studies trip, where they heard presentations from Webster faculty on contemporary security issues affecting the region. For more than 40 years, Webster University has provide high-quality and cost-effective graduate programs at military installations and other locations in cooperation with the U.S. Department of Defense. See more on their presentations below. The head of the HPIR faculty, John Nomikos, noted how the flow of refugees and illegal immigrants has increased from North Africa and the Middle East mostly by the Mediterranean Sea and through the Greek islands in the Aegean. He explained that the refugee and illegal migration crises pose a national security threat to all European Union member countries and can likely harm the cohesion of European societies, acknowledging that European governments have so far reacted spasmodically and without a coordinated action plan. Antonia Dimou, director of Admissions at Webster Athens, presented the regional development of hydrocarbon resources in Israel, Cyprus and Greece, and a number of challenges to the security of future gas infrastructures in the East Mediterranean. She acknowledged that regional countries are at various stages of exploration and development, which are however fraught with political risks and policy dilemmas. As a result, cooperation, conflict resolution and the creation of interdependency structures are prerequisites to unlock the potential of the Mediterranean and safeguard the unimpeded flow of future gas production. Dimou highlighted that infrastructure partnerships between Israel and its neighbors can signal real normalization citing the case of Jordan by saying that: “Infrastructure partnerships between Israel and Jordan can provide real incentives to normalize relations, given that the supply of cheap and reliable energy will bolster the kingdom’s economy and that the Israeli Leviathan partners’ export earnings will increase”. She also emphasized that security needs to be prioritized in the Eastern Mediterranean and acknowledged the need of a collective regional response given that terrorism, human trafficking, and illegal migration pose major threats to the security of the oil and gas industry. RIEAS researcher Aya Burweila presented the volatile political and security situation in Libya and outlined that Libya faces the dilemma of becoming a failed or recovering state. The establishment of a stable Libya through a genuine path to solving the conflict that has divided the country into two competing sets of parliaments, governments and military coalitions is viewed as major challenge. She centered on human trafficking to Europe, pointing out that at the shortest distance, the western end of the Libyan coast is only 290 miles from the Italian island of Lampedusa. Emigration by sea is a timeless dream, and that the price of passage for one migrant is almost $1,600, according to information obtained by smugglers and migrants around Tripoli. Burweila concluded with a set of policy recommendations, namely exertion of diplomatic pressure by Western powers on countries supporting Islamists in Libya, and respect of Libyan autonomy and democracy; provision of logistical support and expertise to the Libyan coastguard; support of the Libyan democratically elected government to prevail against extremists; and strengthening counter-radicalization efforts on social and mainstream media, and other cultural institutions.